For decades, a major gap between two of Fifth Avenue's finest teeth tarnished the boulevard's elegant smile. The "teeth" were the St. Regis-Sheraton Hotel at 55th Street and the former Aeolian Building at 689 Fifth Avenue at 54th Street. The gap was a two-story building that housed Chandlers Shoes and Wempe jewelers before it was sold to its new owner, one of Japan's biggest department store operators. The new building not only filled the gap, it made the multi-building blockfront shine better than any other on the avenue. The Takashimaya building is the best Post-Modern building in the city and, more importantly, it is a superb building whose forceful, vigorous and cohesive design actually excels its two neighbors, both masterpieces of craftsmanship and style. By contrast, the St. Regis is a bit too dolled up and sultry and the former Aeolian Building is a bit too refined and restrained. To navigate between contextual sensitivity and robust independence means treading a very thin line with all the aplomb of a daring tightrope walker. 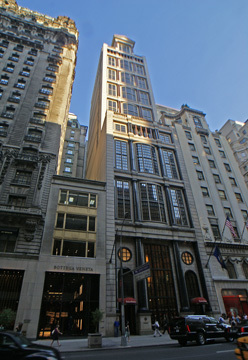 Johnson and Burgee have long focused great attention on window treatment and here their experiments attain a rhythmic climax of extraordinarily rich texture and elegance whose thin columns and expansive glass are vaguely reminiscent of Ernest Flagg's great "Little Singer" building at 561 Broadway in SoHo. The setback pays respect to the first setback of the Aeolian Building while also preserving many St. Regis views and its height does not overshadow the hotel. The multi-paned windows also conjure shoji screens with a little stretch of the imagination and the very high lobby is very elegant. The Japanese concern reportedly paid more than $30 million to Edison Brothers Stores Inc. for the site. This building finally makes "Post-Modern" a good name. In a July 13, article in The Wall Street Journal by Craig Karmin, the building was reported about to "undergo a major facelift and ground-floor expansion as part of the developer's plan to attract a prominent retailer to lease the first eight floors." "Thor Equities closed on a deal to buy the building last week after it submitted a winning $142 million bid in June. The developer plans to spend an additional $40 million to $60 million to change the building's front façade and to expand the ground level up to 6,300 square feet from its current 3,500 square feet, an area considered too small to attract much retail interest. 'A Fifth Avenue location is like buying a billboard to the world,' says Joe Sitt, Thor's chief executive. 'This is the best strip of real estate and I wanted a property that was iconic.' 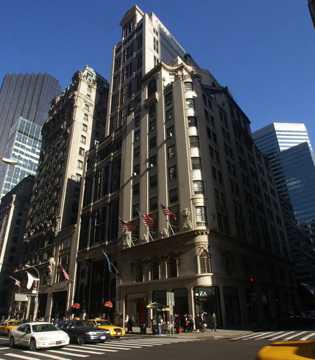 The Takashimaya building, which the Japanese retailer erected in 1993 between 54th and 55th streets as its U.S. flagship store, is less renowned than other Fifth Avenue properties in the East 50s such as the Peninsula Hotel or the Cartier building. But it does have one big advantage: Unlike many of the stately limestone properties on the avenue, the Takashimaya building doesn't have landmark status. That means Thor can take down the facade without seeking the Landmark Commissions' approval. Mr. Sitt plans to make the first eight floors available for retail, planning to replace the black and red granite columns and bowed-out sections with sleek glass windows to display merchandise. Mr. Sitt said he would offer a new tenant the right to name the building after its own brand. He plans to keep the original design for floors nine through 20. This will likely remain office space, but he said residential or even a hotel were also possible. Since the building is about 90% vacant, and with remaining tenant leases due to expire in the next couple of years, Thor will have a relatively clean slate for finding new tenants. But it means that the developer inherits a building with little existing source of revenue," according to the article. Among the contenders she sees: high-end department stores like Nordstrom, Harrods or Harvey Nichols, though they would have to adapt their model to fit a smaller space than they have used elsewhere. Mr. Sitt says he will be talking to European luxury goods companies that are eager for a Fifth Avenue store and see the U.S. market as healthier than back home. But he said he also plans to talk to more 'moderately priced' outlets, noting that Abercrombie & Fitch has a popular Fifth Avenue store, and Japanese casual retailer Uniqlo recently signed a 15-year lease at 666 Fifth Ave," the article continued. According to the article, "Mr. Sitt, who owns about five acres of property at Coney Island, has made headlines recently for his plans to demolish four century-old buildings on Surf Avenue that he says have been left to rot but have drawn protests from preservationist groups." The proposed facade renovation shown in a rendering accompanying Mr. Karmin's article is horrific, a ruthless and tasteless abomination that destroys one of the city's best Post-Modern designs as well as one of Philip Johnson's most elegant while also spittin upon the one glamorous architectural heritage of Fifth Avenue and this block in particular. Shame on Mr. Sitt and shame on the Landmarks Preservation Commission!